​Currently there is no known cause of Parkinson’s or understanding of why some people develop Parkinson’s and not others. This is the reason Parkinson’s is often referred to as “Idiopathic (cause unknown) Parkinson’s”. There are many theories as to the causes of Parkinson’s and it is generally thought that multiple factors are responsible. Through research, our understanding of the possible causes of Parkinson’s is increasing all of the time. Areas of current research include: ageing, genes, environmental factors, chemical exposure and virus like structures called prions. ​Genetic, or hereditary, Parkinson’s where Parkinson’s is passed on from one generation to the next is rare, only a very small percentage of Parkinson’s may have a direct genetic cause. It is more common that a genetic mutation increases the risk of someone getting Parkinson's rather than directly causing it. It appears that these genetic mutations increase the risk of getting Parkinson's; however, even when there is a mutation present the chances of going on to develop Parkinson’s is low. The latest information available indicates that there may be 58 gene mutations that may be implicated in various forms of Parkinson's. We don't know why one person with the mutation will get Parkinson's and another will not although many believe that environmental and genetic factors interact which may cause Parkinson's. ​many scientist consider that Parkinson's results from a complex interaction between a person's genetic make-up, their life activities including environmental exposures. There is some evidence that some toxins in the environment may contribute to dopamine-producing neurons dying, leading to the development of Parkinson’s. In particular, there has been a great deal of speculation about the link between the use of some herbicides and pesticides and the development of Parkinson’s. There are many other examples of different environmental factors leading to the development of Parkinson’s, but as yet the evidence is inconclusive. Parkinson’s disease (PD) impacts people in different ways. Not everyone will experience all the symptoms of Parkinson’s, and if they do, they won’t necessarily experience them in quite the same order or at the same intensity. There are typical patterns of progression in Parkinson’s disease that are defined in stages. 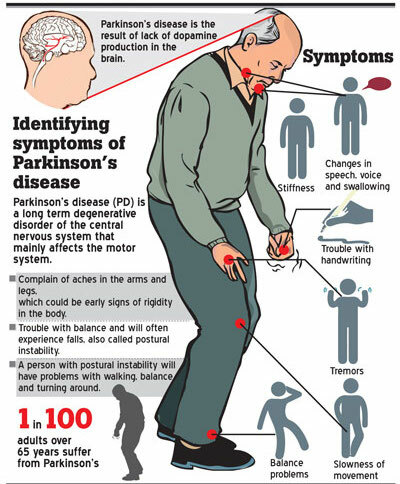 Parkinson’s disease is a long-term degenerative disease that affects the central nervous system. To date, there is no cure for the condition, but there are medications and therapies available to address some of the symptoms and improve quality of life for patients. During this initial stage, the person has mild symptoms that generally do not interfere with daily activities. Tremor and other movement symptoms occur on one side of the body only. Changes in posture, walking and facial expressions occur. Symptoms start getting worse. Tremor, rigidity and other movement symptoms affect both sides of the body. Walking problems and poor posture may be apparent. The person is still able to live alone, but daily tasks are more difficult and lengthy. Considered mid-stage, loss of balance and slowness of movements are hallmarks. Falls are more common. The person is still fully independent, but symptoms significantly impair activities such as dressing and eating. At this point, symptoms are severe and limiting. It’s possible to stand without assistance, but movement may require a walker. The person needs help with activities of daily living and is unable to live alone. This is the most advanced and debilitating stage. Stiffness in the legs may make it impossible to stand or walk. The person requires a wheelchair or is bedridden. Around-the-clock nursing care is required for all activities. The person may experience hallucinations and delusions. The Parkinson’s community acknowledges that there are many important non-motor symptoms as well as motor symptoms. Hoehn and Yahr stages follow a simple rating scale, first introduced in 1967. Clinicians use it to describe how motor symptoms progress in PD. Rates symptoms on a scale of 1 to 5. On this scale, 1 and 2 represent early-stage, 2 and 3 mid-stage, and 4 and 5 advanced-stage Parkinson's. The Unified Parkinson’s Disease Rating Scale (UPDRS) is a more comprehensive tool used to account for non-motor symptoms, including mental functioning, mood and social interaction. Accounts for cognitive difficulties, ability to carry out daily activities and treatment complications. New scales include information on non-motor symptoms (such as sense of smell). While symptoms and disease progression are unique to each person, knowing the typical stages of Parkinson’s can help you cope with changes as they occur. Some people experience the changes over 20 years or more. Others find the disease progresses more quickly. The current theory (part of the so-called Braak's hypothesis) is that the earliest signs of Parkinson's are found in the enteric nervous system, the medulla and the olfactory bulb, which controls sense of smell. Under this theory, Parkinson's only progresses to the substantia nigra and cortex over time. This theory is increasingly borne out by evidence that non-motor symptoms, such as a loss of sense of smell (hyposmia), sleep disorders and constipation may precede the motor features of the disease by several years. For this reason, researchers are increasingly focused on these non-motor symptoms to detect PD as early as possible and to look for ways to stop its progression. Page reviewed by Dr. Ryan Barmore, Movement Disorders Fellow at the University of Florida, a Parkinson’s Foundation Center of Excellence.